In its first-ever unexpurgated edition, a sci-fi landmark that’s a comic and suspenseful tour-de-force, and puts distraction in a whole new light: It’s not you, it’s the universe! Boris and Arkady Strugatsky were the greatest science fiction writers of the Soviet era: their books were intellectually provocative and riotously funny, full of boldly imagined scenarios and veiled—but clear—social criticism. Which may be why Definitely Maybe has never before been available in an uncensored edition, let alone in English. It tells the story of astrophysicist Dmitri Malianov, who has sent his wife and son off to her mother’s house in Odessa so that he can work, free from distractions, on the project he’s sure will win him the Nobel Prize. But he’d have an easier time making progress if he wasn’t being interrupted all the time: First, it’s the unexpected delivery of a crate of vodka and caviar. Then a beautiful young woman in an unnervingly short skirt shows up at his door. Then several of his friends—also scientists—drop by, saying they all felt they were on the verge of a major discovery when they got . . . distracted . . .
Is there an ominous force that doesn’t want knowledge to progress? Or could it be something more . . . natural? 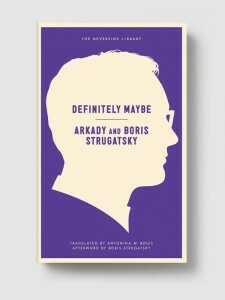 In this nail-bitingly suspenseful book, the Strugatsky brothers bravely and brilliantly question authority: an authority that starts with crates of vodka, but has lightning bolts in store for humans who refuse to be cowed. ARKADY STRUGATSKY (1925-1991) was a specialist in Japanese literature and a translator of numerous books from Japanese into Russian. BORIS STRUGATSKY worked as an astrophysicist and computer expert until starting to write full-time in the 1960s, in collaboration with Arkady. The Strugatskys were the most acclaimed Soviet science fiction writers of the period, and their influence in both Russia and the rest of the world has persisted. The asteroid 3054 Strugatskia, discovered by Nikolai Stepanovich Chernykh in 1977, was named after them. ANTONINA BOUIS is the noted translator of many Russian writers, including Yevgeny Yevtushenko, Tatyana Tolstoya, Sergei Dovlatov, and Andrei Sakharov.